Create eight animations, multiple illustrations and a live action culmination of everything in between, in just four weeks…? Sounds like a job for Mummu. 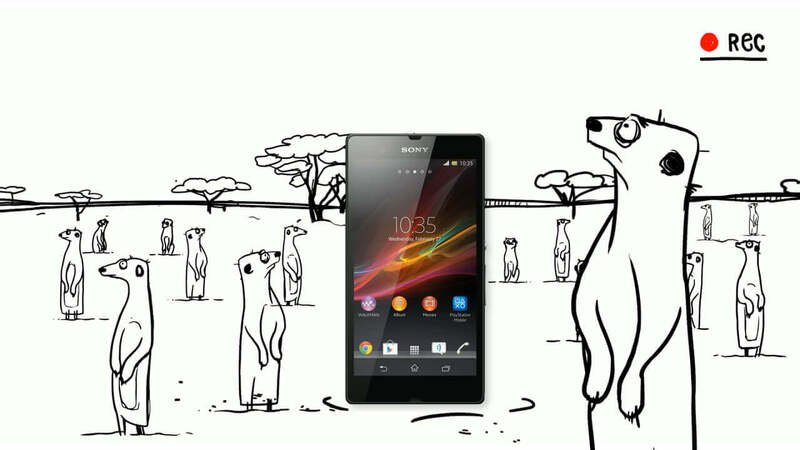 The Xperia Z smart phone was launched globally by creative agency Iris Worldwide, with Sony’s “most ambitious marketing campaign yet”. Using Twitter and Facebook, followers were able to submit tweets on how they would test the smartphone’s features. Mummu then had the joy of visualising the selected tweeted scenario, creating fantastical and engaging animations and illustrations. Due to the responsive nature of social media, each chosen tweet had only four days to be developed from idea to finished animation. When Sony launched the Xperia-Z smart phone in 2013, it had one unique feature, this was the first waterproof phone on the market. Sony’s creative agency Iris, approached Mummu to help them realise their most ambitious social media marketing campaign. Using Twitter and Facebook the campaign encouraged people to tweet/ post ridiculous stories of how they would try to test the new smartphone’s features. The most bizarre tweets would have their stories visualised as animation or illustration throughout the campaign with an overall winner being selected at the end, winning a prize day out. To make this a truly reactive campaign meant the team at Mummu had to work around the clock over a three-week period. As followers tweeted and posted their ideas, the wackiest were chosen by Iris and passed to Mummu. Our team of illustrators and animators then created a mix of digital illustrations and full blown 10 second animations. The final outputs of this non-stop production were seven animations and seven illustrations, not to mention filming the winner’s prize day out! To work on a such a tight turn-around and highly demanding campaign, Mummu had to be sure that we were working in a style that was going to be achievable, but also extremely eye catching and lived up to the hype of the new Xperia-Z. We chose to work with our long-term collaborator and friend, the renowned illustrator and designer, David Lüpschen. His bold graphic black and white line work drawings, meant that we could illustrate well-crafted designs quickly to brief. This exciting line work style then leant its self extremely well to being cell animated in Photoshop, which added to the crafted and traditional look and feel. The whole campaign culminated in a prize day out that enabled the winner to experience their tweet for real; which was to use their new Xperia Z Smartphone whilst being driven at high speed around a muddy and wet rally track. So… our live action crew whizzed themselves up to Silverstone to capture the action in HD and then our team back at base started working on the rushes to get the final output ready on time and finish this unique campaign on a high!